Syrian President Bashar Assad on Sunday called on the Western world to act against Israel, on the backdrop of a wide-scale home front drill launched by the Jewish state. "It's unthinkable that the West keeps silence in light of the Israeli aggression," he said. 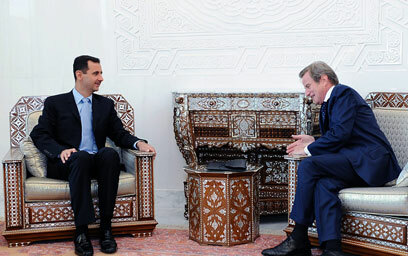 Assad made the remarks during a meeting with French Foreign Minister Bernard Kouchner in Damascus. According to official news agency SANA, the Syrian president noted that if the West is interested in security and stability in the Middle East, it must "start filling an active role in order to restrain Israel and its radical and dangerous tendencies towards security and peace in the region." Assad addressed the resistance issue and "the ongoing Israeli threats to ignite wars and undermine the stability in the region." He said that "the West must understand that the region has changed and that the language, policy and approach used by the countries in the past in regards to the region are no longer acceptable, as is the silence towards Israel's violations and its attempts to spark wars and conflicts." During the meeting, Kouchner gave Assad a letter from French President Nicolas Sarkozy, in which he thanked his Syrian counterpart for the role Damascus played in securing the release of French citizen Clotilde Reiss from Iranian detention. The letter also addressed the bilateral relations between the two "friendly" states, as well as the importance of using these ties to secure regional stability. Kouchner and Assad discussed the Iranian nuclear issue, and the latter stressed the importance of the uranium swap agreement that was signed last week by Iran, Turkey and Brazil. "The countries involved need to change their attitude to Iran's civil nuclear program, because this agreement is an important opportunity to reach a diplomatic solution and prevent a tragic dispute in the region and the world at large," said Assad. See all talkbacks "Assad: Israel trying to ignite war "